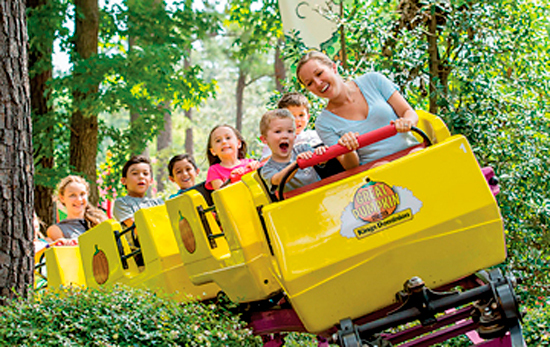 For our family, summer means it’s time to visit Snoopy and the Charlie Brown gang at Kings Dominion’s Planet Snoopy. Planet Snoopy is paradise for Norah, who’s in elementary school, and Henry, who’s almost three. Last Saturday was no exception. We arrived right when the park opened and made a trip to the top of the iconic Eiffel Tower. Shortly after, at ten thirty, Planet Snoopy opened, and we were off. We started with The Flying Ace, which went surprisingly high, and then hit the slower paced Snoopy’s Rocket Express. As we made our way among the rides, we were surprised and happy with how quickly the lines moved in Plant Snoopy. 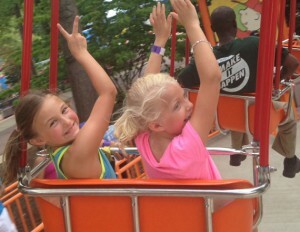 Norah hit a coaster milestone when she rode the Woodstock Express for the first time. The coaster is the fastest and most exciting ride in Planet Snoopy. It feels one step away from the major coasters in the rest of the park. She loved it (so did I). I’ll never forget her squeals of sheer joy. When we pulled up to the platform after it was over, she screamed, “That was AWESOME!” and I lost count of how many times we rode that coaster. The lines were never more than two people deep, even for the front car. 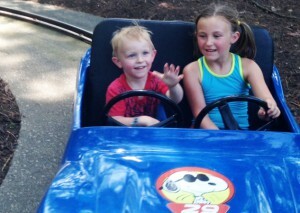 In the 36” height range, Henry was able to ride with an adult on many more rides than we expected. He loved them all. From the lively Great Pumpkin Coaster junior coaster to the subdued Snoopy’s Junction train ride, he was grinning ear to ear. And because we needed to accompany him on many, my husband and I rode most of the rides too. It’s much more fun than watching. Insider tip: the Charlie Brown’s Wind Up swings feel great on a hot day. The kids spent the most time on the Peanuts Road Rally and Peanuts Turnpike where they steered monster trucks and sports cars around tracks. No adults are allowed on this one, but they loved the freedom to ride alone and with friends. Every time they hopped out, they asked to do it again. And again. And again. We happily stood in the shade watching their thrilled faces. Planet Snoopy is family-friendly at every turn down to the Chick-fil-a and the Sweet Frog. It is beautifully landscaped and clean, and the staff members are friendly and kind. After a day of rides, character spotting and fun, we enjoyed ice cream at a café table beside the beautiful fountains near the park entrance and headed home. Planet Snoopy is a rite of summer for us. Norah and Henry are already asking to go back. 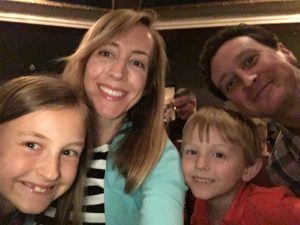 Katherine O’Donnell lives in Henrico County with her husband, Darby, and their children. She’s an avid RVA fan and a University of Richmond graduate. A North Carolina native, she says y’all regularly and believes snow is always an occasion to celebrate. Register now for the Pre-K Pass and process at the park before May 28. 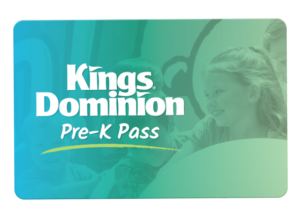 Kings Dominion’s free Pre-K Pass option is a fantastic deal for families with kids ages three to five. Register now for the Pre-K Pass and process at the park before May 28. Get the details here! Read the RFM review on Soak City here. 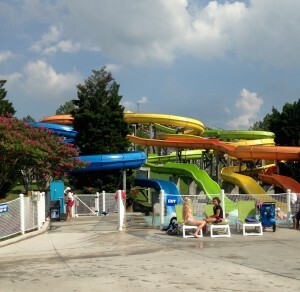 The family-friendly water park at Kings Dominion is part of your general admission price.